Cosmic Hillbashers Hill Running Club was formed in 1992 to answer the call for a local club dedicated to running and competing on the hills. We welcome runners who enjoy off-road hill running of all abilities. Come along and try running with us before you decide to join. Congratulations to Veronique (1st FV50), Phil K, John C. and Rod who all completed Screel on Saturday. 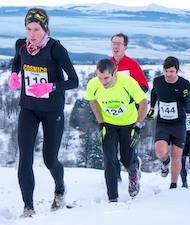 This weekend was all about the Clachnaben hill race with 80 runners and 19 Cosmics taking part. 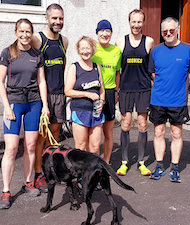 Neighbouring races Tillymorgan Hill (Culsalmond) and Clashmach Hill (Huntly) have announced their 2019 races and they are unfortunately on the same day – 6th July 2019. Phil Kammer finished in 30th Place and 1st M60 at the Criffel Hill race on Sunday 17th March 2019. Results are now on the SHR web site. The headline story this week is that Alan Cormack was one of only two finishers out of 31 starters in The Tunnel Ultra.